to human culture. Others say Einstein or Claudia Schieffer. The recipe below was reverse engineered from montefin's favorite Strammer Max as prepared at the first Gasthaus on the left as you enter Eislingen An Der Fils from the direction of Göppigen in the state of Baden-Wurttemberg, Germany. For more information about Germany's National Midnight Snack, including its reputation for Viagra like effects, visit the Wikipedia article Strammer Max. Melt just enough butter to coat the bottom of a skillet. Over medium heat, toast each slice of Rye bread until just crusty on one side. Remove toast and put ham slices in the skillet. After about a minute, flip the ham and place the rye slices, crusty side down, on top of the ham. After another minute remove the rye/ham stacks and flip them ham side up onto a dish. Add 1 Tbls of butter to the hot skillet, turn up the heat, and fry the two eggs any way you like them. (I'm a sunnyside up guy.) When eggs are done, turn down the heat and, with a spatula, remove eggs and place them on the ham/rye stacks. 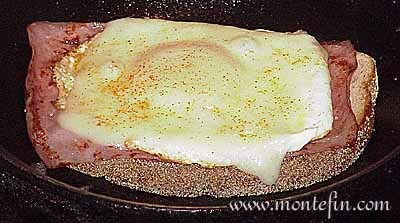 Place a slice of Swiss cheese over each egg, place the cheese/egg/ham/rye stacks back into the skillet and get a good crust on the untoasted bottoms of the rye slices -- about a minute at medium high. Then cover the skillet and turn off the heat. In the short time it takes for the cheese to melt over the eggs, mix coarse salt with 1 to 4 pinches of Cayenne pepper. Remove each Strammer Max to a small dish, sprinkle the tops with the cayenne pepper/salt mix, and serve hot. Getting the right crustiness is the signature of this snack. Think of it as Germany's answer to the Croque Madame. This recipe is based on the Strammer Max prepared at a montefin's favorite gasthaus in Eislingen An Der Fils, Germany. Atkins Diet, South Beach Diet, The Zone, Sugar Busters, CAD, Weight Watchers Diet, and Carbohydrate Addict's Diet are trademarks of their respective companies.